The relationship between individuals having more and less proficiency (often described as expert and novice) is shown below. Not surprisingly, the graph mimics the one depicting the impact of training. The characterization of expertise often centers on the expert’s ability to focus attention and to chunk necessary information. Thus, potentially the expert requires less mental effort to do the same task performed by someone less expert. An interesting byproduct of the relationship between workload and expertise is that one cannot predict an individual’s expertise merely by performance alone. As the figure below shows, both expert and less expert individuals might provide equal performance, yet the underlying workload of the less expert individual could be substantially higher. This is shown by the dotted arrow in the figure—the performance corresponding to the arrow is similar for both types of individual (solid and bold lines) but the workload levels are very different (dotted lines). 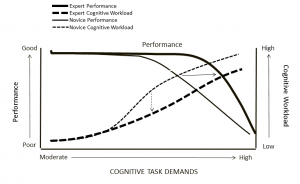 A second byproduct is that the expert individual can most likely continue to have very strong performance for a wider range of task demands than does the novice (the solid arrow). For both individuals, there will eventually be a point at which the task demands are too high and performance begins to deteriorate. That point is reached much earlier for the novice than for the expert.